The Eighty Years' War, or Dutch War of Independence, (1568–1648), began as a revolt by Dutch rebels against Philip II of Spain, the sovereign of the Habsburg Netherlands. During this war, two sieges occurred on Leiden. The first occurred in October 1573, but Leiden was well-prepared with special food supplies and the city’s defense proved successful against the Spanish and the attempted siege ended after a few months. The Spanish returned, however, wizened by the first attempt, on May 26, 1574. The city council had failed to properly prepare the city and Leiden was without the necessary amount of food supplies and the city defenses were weak. 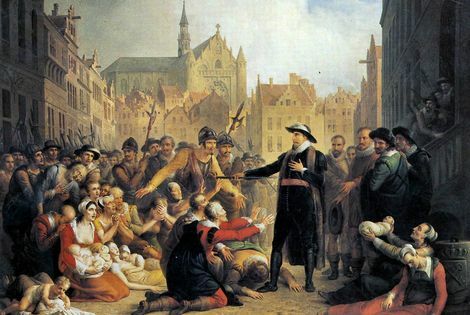 Leiden considered surrender, but the leader of the Dutch rebels, William the Silent, Prince of Orange, was determined to relieve the city and sent message via carrier pigeon, earnestly requesting the town to hold out for three months. His plan was to cut the dikes, flooding precious farmland surrounding the town, so the rebel fleet could come to the town’s relief by boat. The damage would be extensive and the plan was resisted by the surrounding population, but by August 3rd, the dikes were broken. Soon after the breaking, the Prince of Orange, the heart and soul of the rebel cause came down with a violent fever and the relief forces came to a grinding halt. More importantly, the flooding of the farmlands surrounding Leiden took longer than expected because of unfavorable winds. By the end of September, the population of Leiden, after enduring dire circumstances of starvation and a plague epidemic, were crying for surrender. Thousands had died and the remainder feared death at the hands of the Spanish army, as their ruthlessness had killed thousands in Haarlem, a city just north of Leiden. Legend says Mayor Van der Werf, in an act of loyalty to his people, offered his body as food to his hungry citizens. On October 1, 1574, the prevailing winds shifted west and the sea water blew into the countryside surrounding Leiden. The rebel fleet advanced. On the night of October 2, 1574, the Spanish, fearing the rebel fleet and flooding waters, retreated from their fort and lifted the siege. An orphan boy sneaks into the Spanish fort at Lammenschans and finds it abandoned. He finds a stew of carrots, onions, parsnips and meat on the fire, called “hutspot”. At 8:00 a.m. on the morning of October 3, the rebel army, known as the Sea Beggars, makes its way into the city and alleviates the starving citizens with food of herring and white bread. As a reward to the citizens for their bravery, the Prince of Orange gives Leiden two choices: tax-relief for 4 years, or the founding of a university. The citizens chose the latter, and the University of Leiden was founded on February 8, 1575. It is October 2, 2012 at 9:30 p.m. and I am weaving my way through throngs of drunken University of Leiden students. It is Leiden’s Ontzet, the celebration of Leiden’s Relief which has been celebrated for hundreds of years. I already knew all the museums and many public offices were closed on this day. Okay, so it’s a town holiday, I reasoned. But the visualization of the event had yet to appear, like so many things this year in The Netherlands. . . . what could I really expect from this day. I had caught glimmers of what was to be expected during the prior weeks’ conversations with residents of Leiden. One friend tried to describe the scene to me last weekend: “there are booths lined up, all over the streets, stretching from the train station into town.” I’m having trouble picturing this. “Booths, huh, you mean like the Market on Saturday? Or the craziness I encountered on Queen’s Day?” I asked. “No, this is bigger,” she responds. Baby Girl’s teacher at her Dutch preschool also attempted to prepare me, “Oh yes, the Ontzet is very big. Everyone is walking around drunk. Yes, everyone is so drunk!” Again, add that to the list of things I would not have heard my daughter’s daycare teachers say in America. On Monday morning, October 1st, encouraged by my new driving abilities I loaded the kids up in the car and started my trek across town only to be halted short, four minutes into our drive. The entire road had been blockaded. And while there was a kind policeman directing traffic around the blockades, my limited knowledge of driving through the city via any other route resulted in a backwards retreat towards my home, a frustrating unloading of children out of the car and into the bike to the tune of “Mama? Car ride?” and huffy pedaling across town, my bike alternating between sidewalks, bike lanes, and closed roads while dodging electrical cords, curbs, and multiple closed trailers whose contents would later display carnival games, rides, and fattening treats available for consumption to the masses. This morning ride across town was a rough sketch of its typical peaceful cousins I have come to love and appreciate, despite the fantastic weather. Breathless and apologetic, I dropped Baby Girl off at school ½ an hour late. Her teacher, once again, understood my naiveté and joked about my ‘detour’. The shutting down of streets occurred days before the actual event. The afternoon of October 2, I met a friend for coffee at the train station. Every bar in town had created a makeshift covered outdoor patio for the event and some had even rented stages and hired bands to play. She had inquired of one of her favorite restaurants about the financial result of the event – the stage, the bands, and if the restaurant made money. “No, we just break even,” they explained. “Why would you do that?” she asked. “Because it builds customers, it’s like an advertisement, and because it’s fun,” they retorted. We pushed our strollers through the streets. At 2:30 p.m. there was still room to do such things. We were stunned by the people-thrower ride that had been erected in front of the Jumbo grocery store, right outside the station. 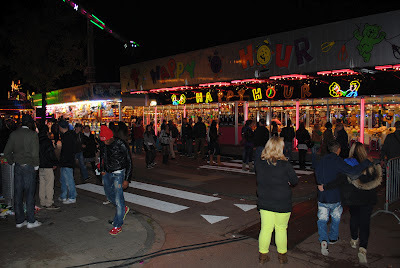 We were amazed by the rows of carnival rides, the displays of Oliebollen (translation: Oil balls – yeah, yummy – basically a beignet crossed with a donut), the candy booths, the displays of herring on ice. We crossed over the bridge and headed back towards the Windmill. I donned my jacket, scarf, and put my camera and wallet into my diaper-bag sized purse. The diapers and a package of wipes were already in there. If anyone wants to try and steal my wallet, they’re going to have to break through this fortress of baby gear, I thought, and I headed out the door. I walked with a determined pace, feeling the energy in the air. Like any football game or 4th of July fireworks show, the signs of a major event were evident from blocks away. Only, here, in Leiden, there weren’t cars parked for miles around, but rather piles of bikes had accumulated at the end of our block and accompanied me along my walk into town. The multitude of lights, booths, noise, and people, in such a compact space was overwhelming. The work that went into creating such a drunken, loud, masterpiece for a celebration that lasts less than 24 hours astounded me. “It kind of puts the Texas State Fair to shame, doesn’t it?” V asked later. I had to agree. As I picked my way through the crowd, I was happy to only be a casual observer with no real intentions in mind besides snapping a few pictures, making the same loop around town I had made earlier with the strollers, grabbing a snack, and making it back home safely. I admired the full moon, the way it highlighted the view of the windmill and the towering swing ride adjacent. I stopped to watch children roll around inside large plastic balls on top of a man-made shallow swimming pool, like hamsters in a cage. I saw things I was glad my children did not see: a drunk woman flat on her back in the middle of Stationsweg, later to be escorted by policemen through the crowd. Piles of cups and paper littered the ground like raindrops. I’ve been here long enough to feel a slight tug of disrespect by the trash on the beautiful canal-lined streets. “Would Van Der Werf of approved of this form of celebration?” I couldn’t help but ponder. (V assured me when I got home, “It’s okay Honey, they’re very efficient around here, I’m sure it will be cleaned up by tomorrow.”) I came to a bottleneck on the bridge crossing over the canal onto the Harlemmerstraat. Vendors had set up booths selling watches and jewelry on the already skinny bridge and everyone we was literally touching everyone on all sides of their bodies. I looked to my left and was shocked to make eye contact with another woman. Her and I were like ferns amongst the canopy of Dutch men and women trees towering above us. “I think we’re the shortest people in this country,” I said to the 5-foot tall woman. She smiled and as the claustrophobia started to unnerve me, the man with her reassured me, “No worries, just go with the flow!” and we did. Taking into account the tiny compact space and the gallons of beer the people around me had consumed, it was a recipe for disaster. One large push and everyone on the bridge could have been severely hurt, but it wasn’t like that. I clutched my purse a little tighter under my arm, but it was in vain. The Dutch, when drunk, are seemingly happy drunks, and I emerged from the mob victorious and unscathed. 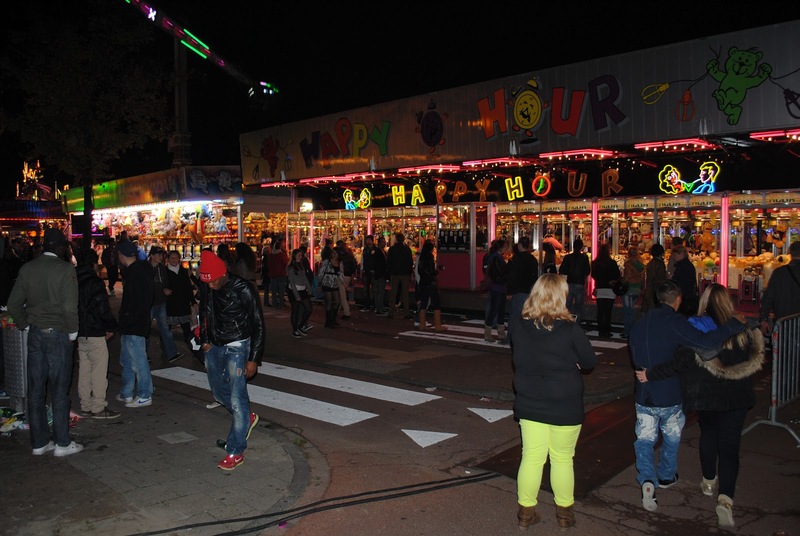 I was wandering around this drunken festival, all alone, a foreigner, but yet I felt completely safe. in Leiden nine months, but I can tell you which roads are cobblestones, bricked, or paved. I know where there are cracks in the sidewalks, where the roots of the trees make the bike rides bumpy. I know which canal bridges are steepest to pedal over, and I know how to get my way around a detour if an alley or road is being repaved. As I wandered around Leiden that night, I never felt lost and I always knew where I could take a side street to avoid the reverie and get home safely. After passing the rows of coffeeshops and corresponding patrons, I came to the foot of the windmill. As the carnival rides blared their nerve-wrecking noise and lights flashed annoyingly in the background, I admired the majestic windmill from its base. It seemed like the lone beacon of sobriety in the otherwise crazy town. I smiled, calmed by its significant presence. I purchased two Oliebollens, snuck back behind the booths to avoid the crowd, ducked my eyes at the man peeing on a building in the dark, and headed home. As I entered the sanctuary of my living room, I handed one of the fattening Dutch treats to my husband, and we collapsed onto the comfortable couch to enjoy a couple of glasses of beer and to compare our individual stories of Leiden’s Ontzet.